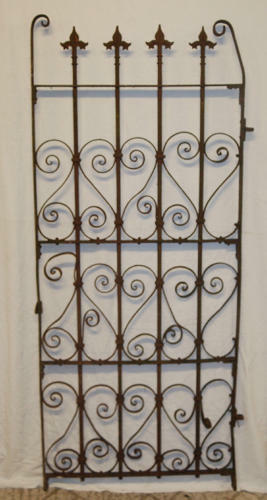 A very pretty, tall, antique cast iron garden gate. The gate is very ornate with beautiful ironwork detailing. The top of the gate features four fleur-de-lys style finials and scrolling ends. The body of the gate has scrolling S shape designs inbetween the iron rods. The gate is possibly French. The gate is designed to be attached to a post or wall and there are two original fixings that will require extra fittings to fix it in place. The gate is antique and does have some signs of use and wear, giving the gate great character. There is extensive surface rust but this does not affect the stability of the item. There is some damage to the decorative ironwork, with some of the iron design missing or misshapen. The gate can be repaired by a blacksmith (buyers responsibility). The gate has abundant charm and character and is of a very pretty design. A fantastic item, that with repairs, would give great style to a home.